A month later, surgeons were able to remove the hand and replant it back on his arm, according to Rex Features. According to the report, Mr Wei's doctors from the Changsha region say he will need to undergo several other operations but they are hopeful that he will regain full function of his hand. "His injury was severe. Besides ripping injuries, his arm was also flattened. "We had to clear and treat his injuries before taking on the hand reattachment surgery." Mr Cairian Healy of the Royal College of Surgeons in England said although procedures such as these were rare, they were not inconceivable. "The Chinese are pretty experienced in microsurgery," he said. "And the concept of saving a severed part of the body by attaching it to another part of the body to give it a blood supply is well recognised. "The ankle is a hard place to graft though. Usually surgeons would go for the armpit because the blood supply is better." He said there were many reasons why a surgeon might not want or be able to reattach a hand to its rightful home straightaway. "The patient might not be fit enough for the surgery. 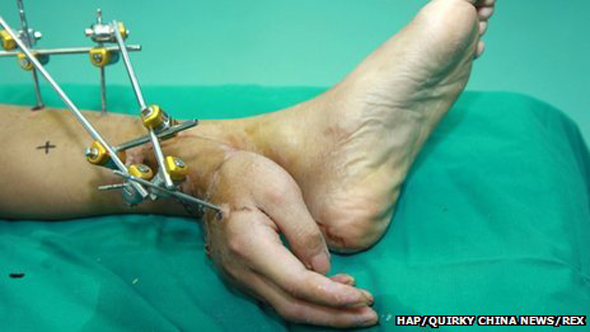 It can take a skilled surgeon between eight and 15 hours to reattach a hand." The vital factor is keeping the hand alive. On ice, it may survive slightly longer, but Mr Healy said few surgeons would contemplate replanting a hand that had been detached for more than a few hours because the muscle inside it would be dead. He said that, sadly, not all replantations are a success. Some patients do not like the end result and may later opt for amputation because of side-effects, such as pain and stiffness.